In a previous article I wrote about using baskets of non-perishable food items as centerpieces at a holiday banquet. It didn’t take that much effort and we were able to donate over 410 pounds of food to a local food bank. When we solicited feedback on the banquet, someone mentioned how great it would’ve been if we could have included some cold weather accessories; after all, this is Minnesota. Accessories? How did we not think of that before? Brilliant! I set off to peruse my “stash”. I think I’ve mentioned before that I have a borderline hoarding issue with things that I think could be upcycled into something else. I blame it all on Pinterest. Thankfully I have an extremely understanding husband and a lot of Rubbermaid storage containers. I set aside a bunch of yarn that I bought dirt cheap at estate sales. That would be good for hats and scarves, maybe even some socks or slippers; we’ll see how creative I can get. Then I hit the Mother Lode, the sweater bin. If you go to yard sales in the warmer weather, people forget how cold it gets in the winter. They sell wool sweaters for a buck or two, yes, WOOL! I don’t care if they have a hole or not, they’re like gold to me. 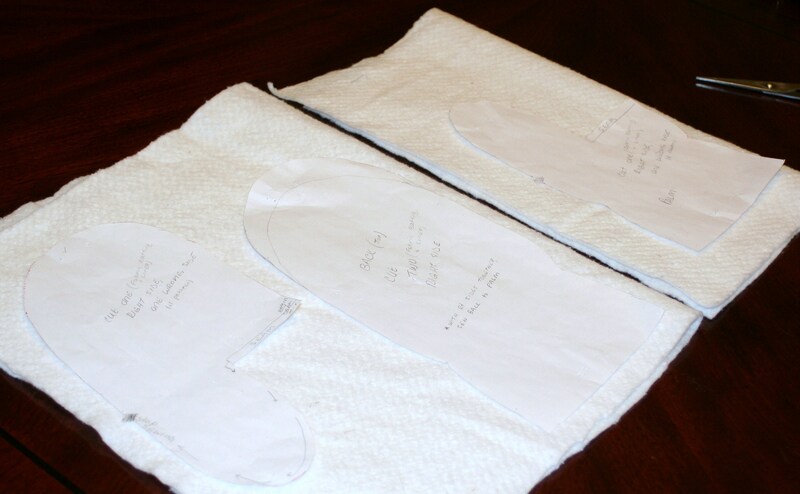 I wash them in hot water and dry them before cutting them apart; first the sleeves and then the front and back. 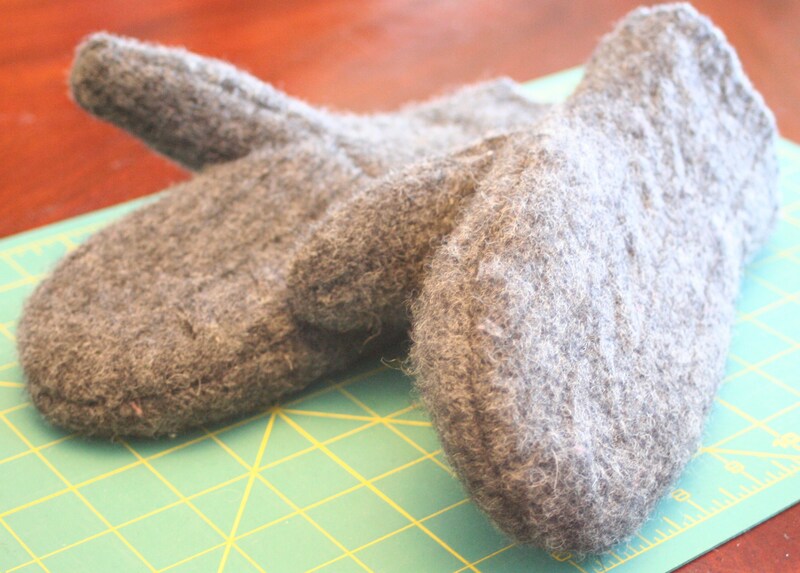 I can get three pairs of mittens from one sweater. I also keep scraps of quilt lining around and clearance fleece blankets that I pick up at discount stores to take care of the other two layers. After a couple hours, I had figured out roughly how much I had in supplies, and a guess-timate of what I hoped to find to finish the project. We will probably have about 30 baskets again for centerpieces this year. I would like to put 3-5 items in each basket to include with our food donation. I know that might sound like a lot, but it’s a totally doable number. What better way to use up odds and ends? People who desperately need winter wear get it, we have more colorful centerpieces, and my husband will delight at my shrinking stash! 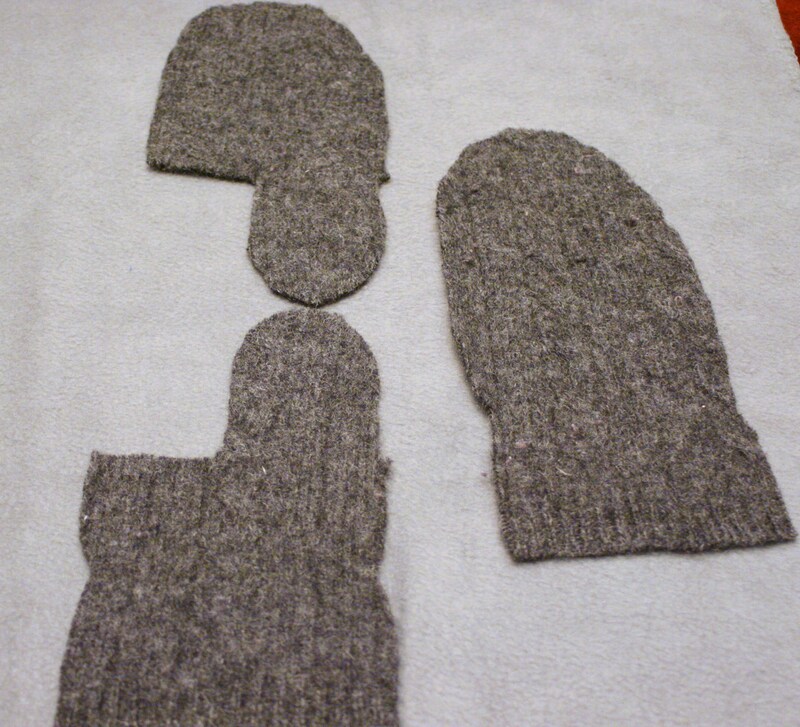 If you would like to make your own upcycled mittens from old sweaters, here is a quick tutorial. Click here for the free PRINTABLE PATTERN. And remember, anyone who receives these items, whether you know them or not, will definitely appreciate them. Happy re-crafting! then separate the front from the back. 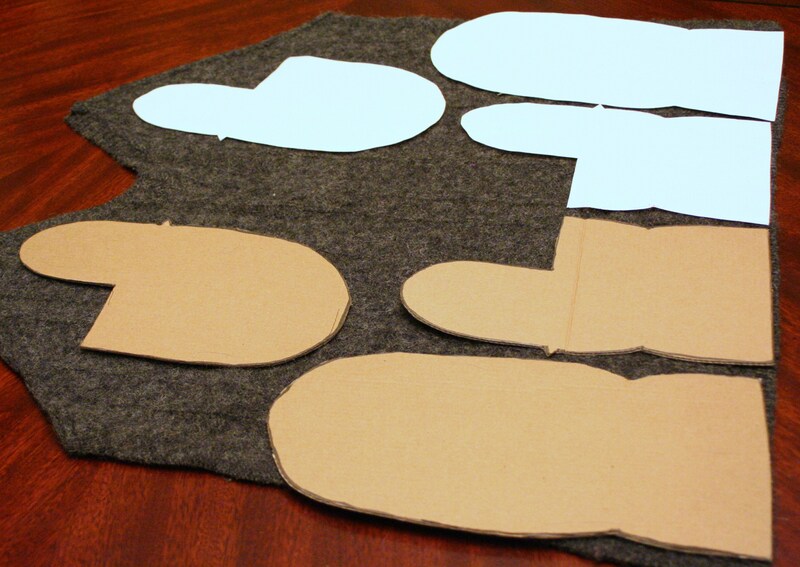 Lay out your pattern pieces and make sure everything will fit! Cut out the quilting and fleece liner pieces. 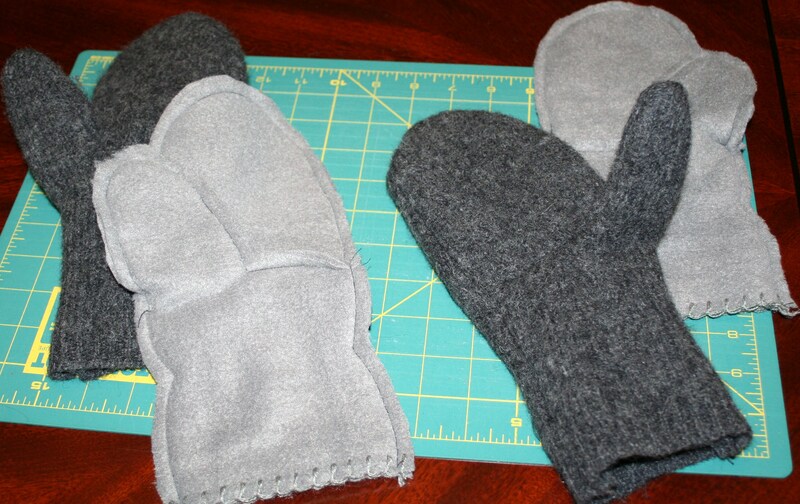 Sew together the palms by matching the thumbs. Then sew the palm to the top. 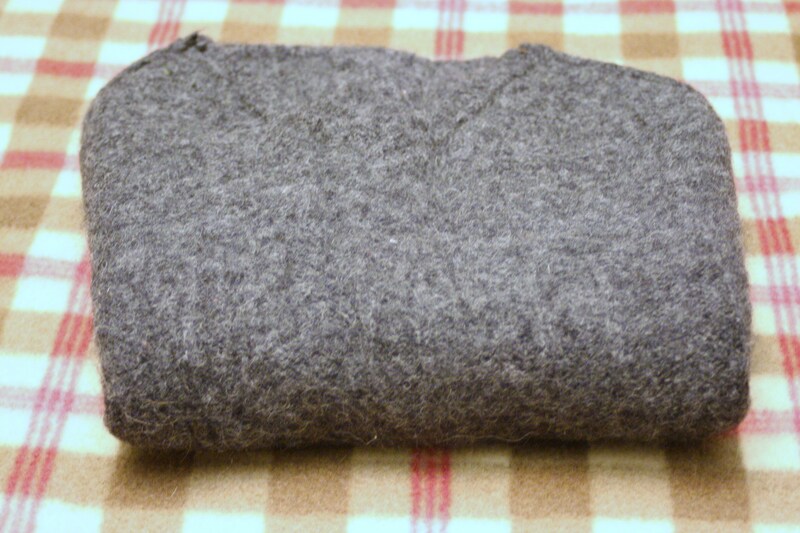 Slide the fleece layer inside the wool and quilting layers. Note the seams for the liner…keep the finished side for your hand! The finished project…quilts for your hands. 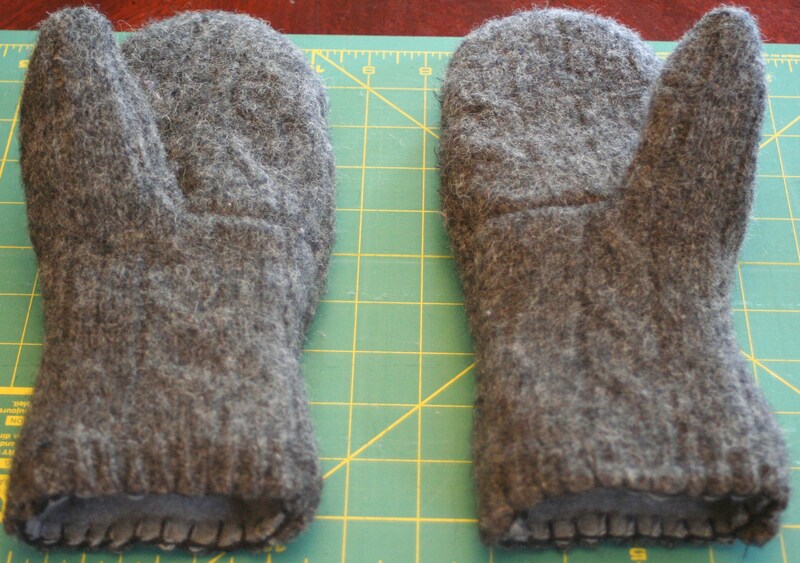 The warmest mittens I’ve ever owned.